In 1796 local land owners met together and discussed modern farming methods. It was becoming increasingly impossible, they said, to farm efficiently when each person owned strips of land in different places all over the three open fields. In common with people all over Britain, they wanted to amalgamate their land into fields and enclose them with hedges. The process was called Enclosure. It would be a major undertaking and would need an Act of Parliament to do it. And whilst it was of great advantage to the larger land owners, small cottagers who only owned a few strips would find themselves with not enough land to make a decent field - and by the time the cost of hedging and ditching had been taken into account, they'd have no land at all, so how would they live? We don't know how the arguments raged but we do know that meetings were held in the Blue Boar public house in Bainton and we can only imagine the conversations which took place there. The result was that, like every other parish, they went ahead petitioned Parliament to allow them to enclose the great fields of Ufford with Bainton and Ashton Parish. As you can imagine, the process was a huge transformation and we can only guess at the feelings that Mary Fell had as she looked out of the very window where I now sit and contemplated the future. If only her dear William had still been alive to help her through this, she may well have thought! In the event, the history books describe the enclosure of Ufford and Bainton with Ashton as very easy and peaceful compared with many enclosures at the time. And when the dust had settled, Mary Fell had been awarded plot 92. 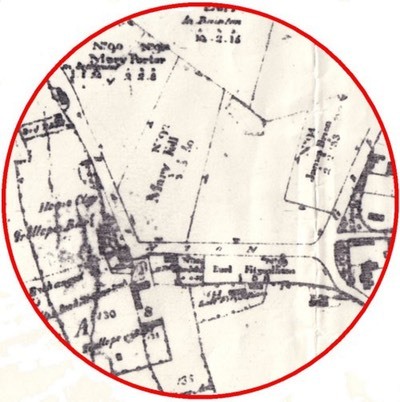 You can see it in the map below which is a detail from the Enclosures Awards map of 1799. (See the full map here or by clicking on the picture below).